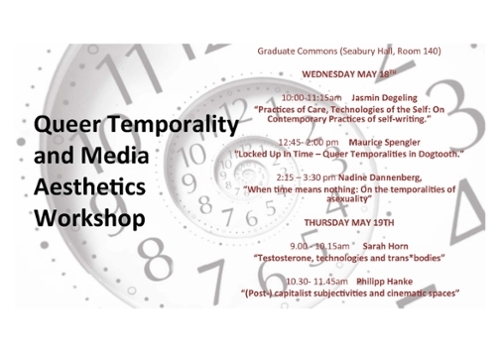 The interdisciplinary dissertation workshop on Queer Temporalities and Media Aesthetics is organized jointly by the Critical Theory Cluster and the Media Studies Department at Ruhr-Universität Bochum. The workshop provides a platform for faculty and graduate students from both universities to discuss current dissertation projects. In 2018 (April 24-26, 2018) Astrid Deuber-Mankowsky and graduate students in media studies and gender and sexuality studies at Ruhr-Universität Bochum have most generously invited 7 graduate students from Northwestern, from the Departments of Art History, Rhetoric and Public Culture (Communication Studies), Screen Cultures (Radio, TV and Film), Musicology, German, and Performance Studies , as their guests, at the upcoming third meeting of the Queer Temporalities and Media Aesthetics workshop. 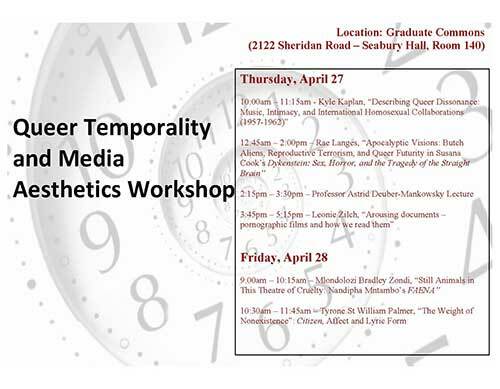 The Queer Temporalities and Media Aesthetics Inter-University Graduate Workshop is a student initiative that brings together graduate students from Northwestern University and Ruhr-University Bochum allowing them to put in conversation the diverse theoretical perspectives and research interests of academic disciplines such as media studies, gender studies and queer theory, philosophy, African-American studies, and performance studies. The workshop initiated in 2015 by means of a generous invitation by the graduate students at Ruhr-University Bochum to have Professor Penelope Deutscher give a lecture at their university in the summer of that year. The following year, the students at Bochum raised enough funds to visit Northwestern University, leading to the first graduate workshop in May. They repeated their efforts in 2017, and so the second workshop took place in April of that year. In 2018, the students at Ruhr-University Bochum invited their Northwestern colleagues to join them in Bochum for the first iteration of the workshop to take place on their campus, once again thanks to their generous financial support. The graduate students received aPR.INT (Project International) fund from the Ruhr-University Bochum Research School PLUS. The initiative that enabled the visits by Penelope Deutscher since 2015 is a VIP (Visiting International Professor) Grant, also from the Research School. For further information on both funding opportunities, please visit http://www.research-school.rub .de/rspp.0.html. Since its beginnings in the early 90s, queer theory has aimed at critiquing and undermining established cultural and economic, social and political power relations that marginalize and suppress nonconforming individuals and groups. Recently, many of its theorists have turned towards the exploration of queer temporality as a particular perception of the world, of the (political) self, individual experience and collective agency. Relevant works include critiques of reproductive futurism (Lee Edelman), the thoughts on the queer archive and the significance of feeling “backwards” (Heather Love) as well as the concept of cruel optimism – violence and social or economic precarity understood not just as moments of spectacular crisis but also as slowed time and associated with lived, habitual, quotidian violence that becomes ordinary (Lauren Berlant, Sharon Holland). At the same time, queer theory’s ongoing engagement with media studies has also turned to explore the specificity of the aesthetics of time-based media, thinking the differentials of cinema, TV, interactive installation, Internet, and social media. Our cross-university and interdisciplinary research group will analyze how these different temporalities intermingle. In this context, we will ask: what is the role of the aesthetic in its double sense as perception and as philosophy of art and also how it merges with the political, the revolutionary, the utopian and anti-utopian and with problems of social transformation. Queer theory’s interest is to question normative structures that organize our daily live but also to ask for such structures in the processes of our gaining knowledge of the world. With such an epistemological perspective queer theory aims to render marginalization of lives, individuals or communities visible and tries to overthrow or stretch the boundaries of a rigid and excluding normativity. With the focus on temporality our workshop takes into consideration the impact of a mediated environment on the understanding of and dealing with the constitution (and that all too often means exclusion) of groups or individuals and how to encounter them aesthetically. Under the condition of most recent political developments especially in the US and Europe, engaging with queer theory has become ever more important with regard to media (practices), as their intersection helps problematize current dynamics of subjectivation and collective agencies.